The Tuscany jacket lives up to the hype. Most days I am comfortable wearing one base layer, but if it is really cold outside I'll add a thicker mid-layer. The Tuscany has eased shoulder, waist, and hem measurements so there is no need to size up to leave space for layers. I am about 5'5"
An Obermeyer classic, the Tuscany offers an alpine sporty style with technical features that make the jacket as functional as it is fashionable. With 150 grams of Thermore Classic insulation in the body and 40 grams in the hood, the Tuscany is your perfect cold weather companion. 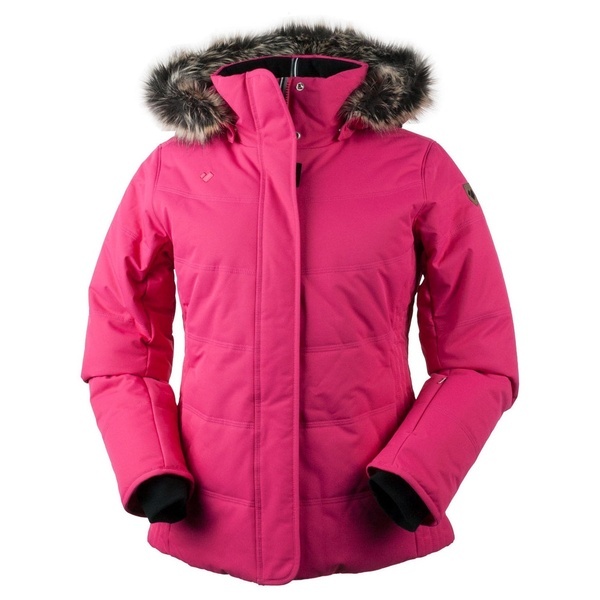 Plus, the extra soft fleece-lined collar and stretch inner cuffs will make the jacket so comfortable that you won't even want to take it off once you're inside. An interior electronic pocket and stretch mesh stash pockets with a detachable, scratch-free goggle cloth provide enough space for everything you'll need during a day on the mountain. Warm enough for Aspen's coldest days and stylish enough to wear around town, the Tuscany is a go-to choice for any cold weather outing. The 2018 model is slightly updated with the new Obermeyer logo located on the center back of the jacket.